This is a place-holder post; it says more ‘I know I ought to post on my blog’ than anything else. I have had, one way and another, a very busy week indeed. To me, this story is always intertwined with another one: James Naylor‘s recreation of it. I’m afraid I read all of these week’s lections and went, ‘no, really, I don’t think I have anything to say here’. Consequently I am quizzing people about what other topics I should tackle; but it seems silly to give up here and I will keep on going until Easter. Maybe at least that story will have some inspiration in it! Some of this seems okay. “…unless a grain of wheat falls into the earth and dies, it remains just a single grain; but if it dies, it bears much fruit.” This symbolism is familiar to me, at least, and although I’m not sure about the implications (am I the sower, letting go of the grain of wheat I have now for more in the future, or the wheat itself, dying to create fruit? Since human reproduction doesn’t generally work like that, the latter has to be a metaphor but it’s not quite clear for what. Or is it my ego which is the grain of wheat? This starts to sound more Buddhist quite quickly). The next bit sounds horrible, though. “Those who love their life lose it, and those who hate their life in this world will keep it for eternal life.” If you turn this into instructions, how does it come out? On no account like your life, because if you do you’ll lose it; but try not to mean it, because if you genuinely dislike your life, you’ll be cursed with one into eternity – which you will, presumably, hate as a result. Lesson 1 (alternate): Judges 4:4-9. The compilers of the Inclusive Language Lectionary may have had this in mind when they looked at this week’s readings from 2 Chronicles, Ephesians and John and decided to add the option of a passage from Judges about Deborah. There is, as the Jewish Women’s Encyclopaedia says, “no other heroine like Deborah in the Hebrew Bible”. She is shown as – among other things – a mother, a prophet, and a military commander. I am not sure – as I said last week about Jesus – that this makes for a brilliant role model as such, but I suppose it’s got to better than nothing, which is what you often find when you search Bible stories for female role models. That conversation quickly went off into details about what the Greek means, which is fascinating but not what I want to focus on today. The question which intrigues me about this story, within a Christian context where Jesus is meant to be a role model – where the answer to a question like ‘What would Jesus do?’ is expected to point to what we should do – is: is this the sort of thing we should do? It doesn’t seem very Quakerly, does it? 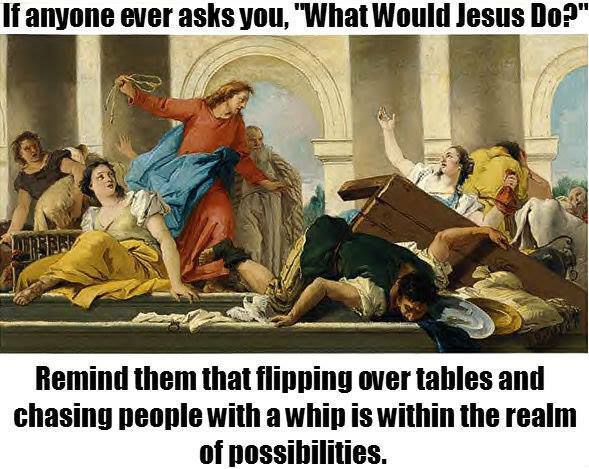 Not just property damage – turning over tables – and theft – throwing coins around – but actual violence with whips. (It’s often depicted as against people, as in this image, but the text seems to say that it’s ‘both the sheep and the cattle’ which get driven out – which seems a little more reasonable, and it does pre-date the era of animal rights. That said, it still seems pretty violent and likely to hurt people as well.) If this is one of the answers to ‘what would Jesus do?’, is that the right question? Using a whip still seems unlikely to contribute to peace, even if this updated version might, taken as a metaphor, be pointing us in a helpful direction. I’m finding both of these passages irritating. I’m not sure whether it’s that I’m in a bad temper anyway, or if there is something genuinely bothering about them. At first I thought I might write about how Sarah is treated in this story – Abraham gets to make a covenant, she gets to have a baby – but I don’t think it’s that, or at least not just that. (After all, Abraham has to have surgery, too, so it’s not like it’s all fun and games for him.) In a way, both this and the gospel passage are about giving up your life, your freedom and choices, for God – an appropriate theme for Lent, and perhaps one you’d expect me to kick back against, being as I am your common or garden lazy selfish so-and-so. In this very plain telling, the temptation narrative takes on a kind of minimalist clarity. It is the Spirit who sends Jesus out into the wilderness, and it is the angels who wait on him – it seems to me from these signs that the experience of being tempted is sanctioned by God. In some way, it must be, if not good, then part of the larger plan. It’s tempting (did you see what I did there?) to read it as a test, a kind of exam which Jesus has to pass before he’s allowed to begin his ministry. I feel like there’s something off about that reading, though; setting tests in relationships isn’t actually very helpful (‘I’ll only stay friends with X if they turn up on time/buy me a birthday present/stop telling that joke’), and God has clearly already established the relationship with Jesus – in only the last paragraph, we heard God say to him, ‘You are my Son’. So instead, perhaps it’s more like a teaching, an experience which Jesus needs to go through in order to begin his ministry. This seems plausible; people who have suffered or been tempted themselves are often more compassionate towards others undergoing the same struggle. In this telling, the wilderness sounds like a mythical place, populated by Satan and wild beasts and angels. Presumably it was the real desert, but I think we can equally well presume that it needn’t have been, that Satan and angels can find one anywhere. Wild beasts have a good go at getting everywhere although of course some species do better than others. (I suspect that the wild beasts we picture when we read this story are a bit more dramatic than, say, magpies and squirrels, although I have no idea how historically accurate my imaginings are.) The key feature of the wilderness from an emotional point of view seems to be that one is without human company. Neither wild beasts nor angels seem likely to replace a chat with a friend! That said, there is clearly much to be learnt from all of them. Perhaps this is my Druid background coming through, or those early lessons about birdwatching, but I find a lot to learn from the wild beasts – even the magpies and wagtails and squirrels and suchlike that can be spotted in the city – and I can even point to places in the gospels where Jesus draws those kinds of lessons (Luke 12:24, for example). Similarly, the conduct of the angels must have something to teach, and from Satan – if you know what you are watching – presumably you can learn how not to do it. I am becoming clearer about the shape of this blog project. I keep thinking, sort of accidentally, of it as a project which is about the Bible. It isn’t, or isn’t really, or is only accidentally about the Bible; really, it’s about reading the texts, the ways in which we – but mostly me – relate to them. It’s about reading and reception. So here’s a post about reading (part of one of) the extracts offered for today. I’m pretty sure that it directs contradicts this if you decide what to give up for Lent and then go on your blog or on Facebook and announce it. It might be helpful to you – peer-group accountability does often help with will-power – but it can also seem like bragging, or be hurtful to others. (Consider the effects of all those ‘I’m giving up chocolate’ posts on someone who already has some form of disordered eating.) So I’m not going to tell you what I’m doing for Lent – although I will note that plenty of Quakers, who ‘don’t do’ times and seasons, were talking about pancakes yesterday. What about the second part of this passage? Well known words: do not store up your treasures on earth… It has to be said that I do, in fact, store up treasures on earth, in lots of ways: I have an ISA and a bookcase and a purse; I also have a list of friends on Facebook and a CV and some poems which I memorised. Are those on earth, though? Especially if heaven is here and now, the distinction between the two doesn’t seem so clear. Some items on the CV, for example, seem quite earthly – getting published in such-and-such as journal or working at so-and-so is of this world. But what about the less tangible things which might also feature? Does spiritual work – like facilitating workshops on religious matters or running a study group or serving your (spiritual) community – count up anything towards the heavenly list? Although it might appear on my earthly CV, it seems to me that a lot of the benefits of these activities – the deepening of my own prayer life and (hopefully!) that of others, for example – might be ‘treasures in heaven’. Reading this, I wonder where my heart really is. When I’m not interested in my work, I often say that ‘my heart’s not in it today’ – and yet, if you look at the pattern of my life overall, my heart is very much in my work and I’ve placed my work at the heart of my life. Fortunately for me, this has been possible for the time being, and my present work takes me towards, rather than away from, my spiritual life. I can’t say that was true when I was on the till in M&S or struggling through ESA applications!